Extracts and unpacks the SPI/BIOS modules from Dell HDR executables. After extraction, the HDR image is automatically unpacked into individual SPI/BIOS modules via LongSoft’s PFSExtractor-RS tool. 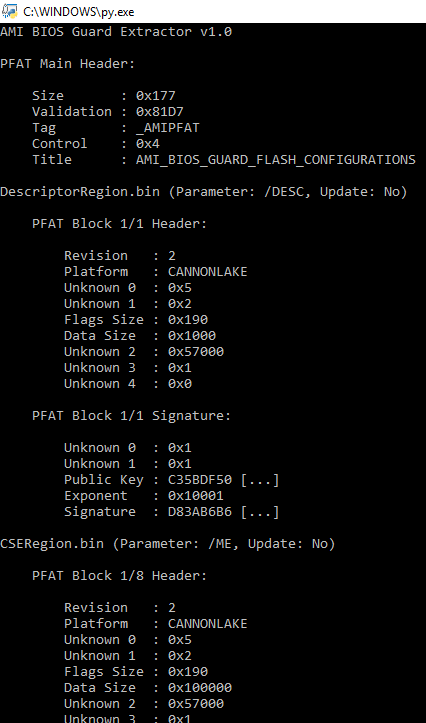 Parses AMI BIOS Guard (a.k.a. PFAT) images and extracts a proper SPI/BIOS image. Parses Apple Software Update CatalogURL .sucatalog files and saves all EFI firmware package links into a text file. It removes any xml formatting, ignores false positives, removes duplicate links and sorts them in alphabetical order for easy comparison afterwards. Parses Apple EFI files and renames them based on Intel’s official $IBIOSI$ tag as follows: Model_Version_Build_Year_Month_Day_Hour_Minute_Checksum. The checksum is calculated and added by the utility in order to differentiate any EFI files with the same $IBIOSI$ tag. In rare cases in which the $IBIOSI$ tag is compressed, the utility automatically first uses LongSoft’s UEFIFind and UEFIExtract tools. Parses Apple multiple EFI firmware .im4p files and splits all detected EFI firmware into separate SPI/BIOS images. Parses Panasonic BIOS Update executables and extracts their SPI/BIOS image. The utility automatically uses Rustam Abdullaev’s unpack_lznt1 tool in order to decompress the initially Microsoft LZNT1 compressed resource data. Parses Award BIOS images and extracts their modules. The utility automatically uses Igor Pavlov’s 7-Zip tool in order to decompress the initially LZH compressed sub-modules.